Most places in the northern hemisphere December 1 is long past time for riding over passes. 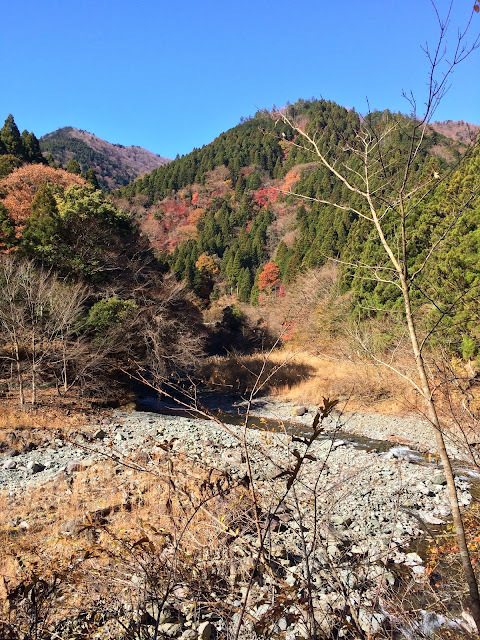 Not in the area around Tokyo, where we are blessed with relatively dry, sunny weather and fall foliage in late November through December. Today was no exception. My tire went flat here on the lower Yabitsu climb. I could enjoy the view while I changed the tube! 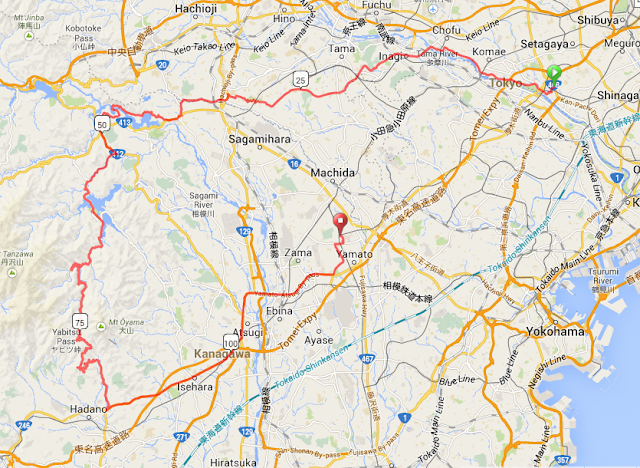 I took one of the shorter classic Positivo Espresso routes, just under 120kms -- out Onekansen Doro, the "tank road", Machida Kaido, the south to briefly join Route 413, then looping around the North side of Lake Tsukui, winding my way to Lake Miyagase, then up and over Yabitsu Pass (Elev 760m -- approx 2500 feet), and down the South side to Hadano. Instead of taking the slow Odakyu train home, I rode in another almost 20 kms on Route 246, then hopped the Denentoshi Line train from ChuoRinkan Station. Often photographed -- the Michi no eki and park at Lake Miyagase. Both bike and rider rest at the top of Yabitsu. Today's ride. 118 kms distance ddddand 1400 meters climbing logged.